Greenhouse gas emissions from the existing building stock is a significant contributor to climate change and we need more policies focused on investing in and upgrading our existing buildings to address this issue. 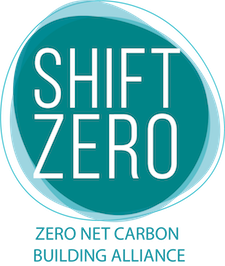 Energy performance disclosure at residential point of sale is one such policy, and Shift Zero members are engaging with municipalities to explore how this practice can promote improving carbon efficiency of existing homes. Home energy use is a major contributor to a household’s expenses and carbon footprint, but prospective home buyers cannot easily access information about it today. We aim to empower homeowners to save money, enjoy a more comfortable home, and reduce their carbon footprint by supporting legislation to disclose home energy consumption data to prospective buyers. A model disclosure policy was implemented in 2018 by the City of Portland. The Portland Home Energy Score policy requires sellers of single-family homes to provide a Home Energy Report and Score at time of listing. The Home Energy Score report provides a rating for the home’s energy efficiency – like an MPG rating for a car. It also suggests upgrades that will improve the home’s energy efficiency, and an estimate of how much energy savings and reductions in utility bills will result. Home Energy Score assessments are easy to schedule, and cost about $150. The City of Portland recorded about 9,000 Home Energy Score assessments in 2018, out of a total of about 14,000 single-family residence sales. The scores showed significant opportunities for improvement and savings. About a third of homes scored 3 or less on a scale of 1 to 10, where 10 is the most efficient. By implementing recommended improvements, owners are predicted to save $578 per year on utility bills and enjoy a more comfortable home with higher resale value.